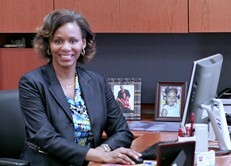 I am Dr. Vickie Trotter the new Principal of Barack Obama Learning Academy. As the new Principal of Barack Obama Learning Academy, it is my sincere pleasure and honor to become a member of the Hazel Crest School Community. A new principal presents opportunities for various new possibilities, new beginnings, and often new ways of doing things. I understand newness alone cannot produce transformation. We ourselves must be willing to be caught up in the restoration that is possible with each new school year and be willing to make necessary changes that put students first. This year, we will concentrate on the processes that spur continuing advancement: evaluate what we have, determine what we must do to get better, and create a strategic plan to implement necessary enhancements. One of my first goals is to partner with teachers to address school culture, set high standards for teacher performance, set high academic expectations for all children, and provide supportive systems to assure our new goals are met. As your principal, it is important to me that everyone who steps through our doors: staff, students, parents, and guardians are excited to be apart of the EAGLE’s TEAM! This attitude will enable us to meet the challenges of academic excellence in a positive and nurturing environment. We recognize that in order to be successful in school, children need support from both home and school. We know a strong partnership will make a great difference in your child’s education. Does their homework every day and ask for help when needed. Follow the school and classroom behavior plans. Share information from the school everyday. Help in making Barack Obama Learning Academy a wonderful and safe school. As I conclude, here are a few things to make our year go more smoothly – first, I am asking families to please help us to have a safe arrival and dismissal process by following the safety procedures. These procedures will be on the website and available during registration. Another way to help our year go smoothly is to consistently visit the Barack Obama Learning Academy website. It has information you need to keep on top of what’s happening at school. · Wednesday, August 10, 2016, we would like to invite families to stop by the school between 10:00 A.M. and 11:00 A.M. and between 4:30 P.M. and 5:30 P.M. to meet your new Principal and Assistant Principals. learning begins at 7:50 A.M. I hope you enjoyed your summer vacation. The administrative team and teachers are looking forward to partnering with you and our students as we work toward achieving an academically successful school year. If you would like to contact me, please call the school phone at 708-825-2400.